LOS ANGELES -- Los Angeles World Airports (LAWA) and Unibail-Rodamco-Westfield Airports are taking an innovative, inclusive approach to the Competitive Evaluation Process (CEP) for the 750,000-square-foot Midfield Satellite Concourse at LAX – slated to open to the public in 2020. 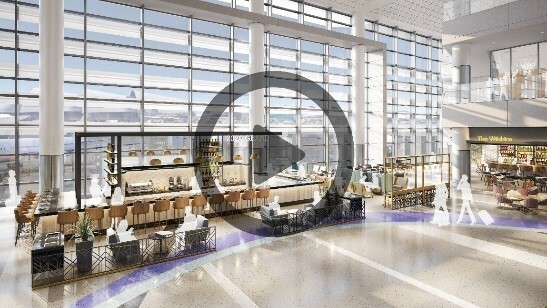 The CEP will be open for 27 dining, retail and amenity opportunities in the new Concourse, encompassing 28,000 square feet of dining and retail space. These opportunities include a wide selection of individual, open-to-bid spaces for brands and operators to bring in a truly authentic L.A. feel. Two of the opportunities are available exclusively for small business and ACDBE participation. The deadline for proposals is May 18, and all related documents are available on the CEP website at: www.urwairports.com/laxcep. In articulating the vision for the new concourse, Unibail-Rodamco-Westfield Airports has revealed an overall design theme, called ‘Neighborhoods’, which will exude a cool, hip, and modern California vibe while at the same time paying homage to L.A.’s Downtown (DTLA), Mid-City and Ocean Communities. Each of these distinct neighborhoods will be highlighted within three concourse districts differentiated from one another through simple sculptural forms, artisanal materials and creative palettes. LAX, the fourth-busiest airport in the world and second-busiest in the United States, was named a top-10 U.S. airport by SKYTRAX. LAX served more than 87.5 million passengers in 2018 and offers an average of 700 daily nonstop flights to 109 cities in the U.S. and 1,281 weekly nonstop flights to 93 markets in 47 countries on 69 commercial airlines. LAX ranks 10th in the world in air cargo tonnage processed, with more than 2.4 million tons of air cargo. LAX handled 707,883 operations (landings and takeoffs) in 2018. Unibail-Rodamco-Westfield is the premier global developer and operator of flagship shopping destinations, with a portfolio valued at €65.2 Bn as at June 30, 2018, of which 87% in retail, 6% in offices, 5% in convention & exhibition venues and 2% in services. Currently, the Group owns and operates 93 shopping centres, including 56 flagships in the most dynamic cities in Europe and the United States. Its centres welcome 1.2 billion visits per year. Present on 2 continents and in 13 countries, Unibail-Rodamco-Westfield provides a unique platform for retailers and brand events, and offers an exceptional and constantly renewed experience for customers. With the support of its 3,700 professionals and an unparalleled track-record and know-how, Unibail-Rodamco-Westfield is ideally positioned to generate superior value and develop world-class projects. The Group has the largest development pipeline in the industry, worth €11.9 Bn.